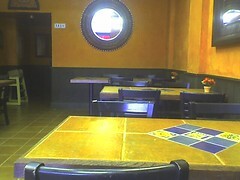 Months after the great El Burrito fire, the doors are open again and the interior seems cleaned up. In the first incarnation, El Burrito wasn't the prettiest place in Allston Rock City. Many thanks to Nikhiel for the pictures of the new interior. This entry is filed in El Burrito. Monday, October 24, 2005 by Jonah.